The dining business is famously challenging. Employee turnover, equipment failure, and a dozen other factors can make or break the bottom line. On top of the typical issues, a manager also has to deal with safety and security. A restaurant faces risks from both inside and outside its walls. This post addresses some of the major threats. Unfortunately for business owners, employee theft is most common. There are many opportunities for a server or bartender to steal from the company. These include skimming the register, voiding or shorting receipts and then pocketing the difference, comping friends, over-pouring drinks, and many other types of ticket manipulations. The high rate of credit card use in daily transactions means that thieves could gain access to customers’ private information. Theft of credentials results in considerable damage to the reputation of your business. With a large amount of cash on hand, especially in the early morning or late evening hours, a restaurant could be an appealing target for armed robbery. Since restaurants often have multiple entrances and exits, it is essential to add security by zones. The goal is to provide open traffic during business hours while maintaining observation. Providing staff with training and tools to react to potentially dangerous situations is also vital. An act of violence can be a physical altercation between patrons, or employees. Restaurants serving alcohol or open late are often at risk of threats for violence. Losses may include broken windows, graffiti, and the destruction of signs. In an instant parking lot accidents can result in injury to both patrons and employees. With a high volume of automobile traffic, damage to vehicles and structures may occur at some point. The busy environment of a restaurant, with servers, continually coming and going creates the potential for slips and falls. Spills, greasy floors, a buckled mat or other obstacles can send an employee or customer to the hospital. Blinds or tinted windows help keep customers comfortable. The downside of these items is that they can also create a cover for criminals. They may take these as an invitation to commit a robbery. 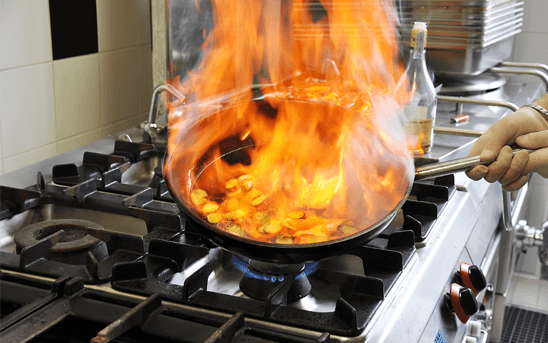 The average restaurant has all the ingredients necessary for a dangerous fire – hot equipment, open flames, natural gas connections, cooking oil, cleaning products and abundant supplies of paper products. There are thousands of restaurant fires each year, according to FEMA, the average loss per fire is $23,000, but this number can often be much higher. Thankfully, relatively few people die in restaurant fires, but the most significant damage is to the business operation. In 43% of restaurant fires, the cost is extensive enough to force restaurant closure, at least temporarily if not permanently. Fire extinguishers and automated fire notification and suppression systems are a must for every business. First, security devices such as video cameras and access controls can reduce risk. Panic buttons can shorten response times and save lives in the case of a robbery. Security cameras can be utilized to identify potential suspects. A combination of a Point-of-Sale (POS) system with video recording can help prevent the majority of employee theft, saving your business thousands in revenue. Secondly, even the presence of security signs and related equipment can help act as a deterrent to violence and vandalism. Lastly, implementing a smart security plan with an experienced vendor will protect your operation for years to come.